Lubriguard Hi-Temp EP Moly Grease is a high-performance, multipurpose, extreme pressure (EP) lithium complex grease developed to satisfy the severe lubrication requirements of construction and off road equipment manufactured by Caterpillar, Komatsu Dresser, Case New Holland, John Deere and others. Lubriguard Hi-Temp EP Moly Grease is particularly recommended for use in off-highway trucks and heavy equipment such as bulldozers, motor graders, pipe layers, scrapers, skidders, wheel loaders and soil compactors operating under heavy or shock load conditions. Lubriguard Hi-Temp EP Moly Grease Grease is manufactured with high-quality, heavy base oils thickened with a lithium complex soap. Lubriguard Hi-Temp EP Moly Grease contains an effective extreme-pressure additive, 3% molybdenum disulfide (moly), a tackifier, and rust and oxidation inhibitors to provide excellent wear protection as well as excellent corrosion protection and resistance to water washout in equipment operating under wet conditions and/or high temperatures and subject to heavy or shock loading. 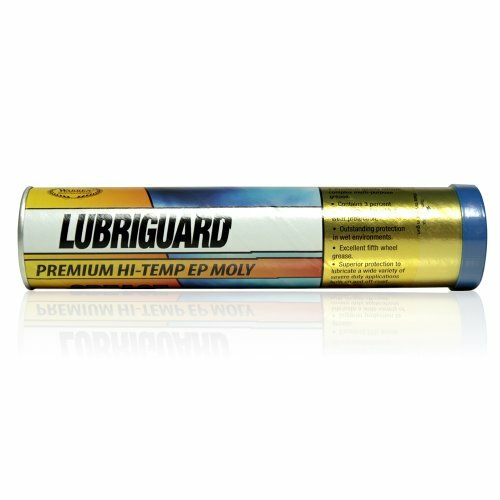 Lubriguard Hi-Temp EP Moly Grease is a high-performance, multipurpose, extreme pressure (EP) lithium complex grease. Developed to satisfy the severe lubrication requirements of construction and off road equipment manufactured by Caterpillar, Komatsu Dresser, Case New Holland, John Deere and others. Lubriguard Hi-Temp EP Moly Grease is particularly recommended for use in off-highway trucks and heavy equipment such as bulldozers, motor graders, pipe layers, scrapers, skidders, wheel loaders and soil compactors operating under heavy or shock load conditions. Lubriguard Hi-Temp EP Moly Grease contains an effective extreme-pressure additive, 3% molybdenum disulfide (moly), a tackifier, and rust and oxidation inhibitors to provide excellent wear protection. If you have any questions about this product by Lubriguard, contact us by completing and submitting the form below. If you are looking for a specif part number, please include it with your message.